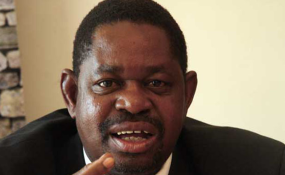 Zanu-PF Secretary for Legal Affairs Munyaradzi Paul Mangwana. Mr Chamisa last Friday filed his election petition at the Constitutional Court challenging President Mnangagwa's victory in the July 30 harmonised elections. Section 67 A (1) of the Electoral Act (Chapter 2:13) that deals with Recounting of Votes states that: "(1) Within forty-eight hours after a constituency elections officer has declared a candidate to be duly elected in terms of Section 66 (1), any political party or candidate that contested the election in the ward or constituency concerned may request the Commission to conduct a recount of votes in one or more of the polling stations in the ward or constituency. c) state how the results of the election have been affected by the alleged miscount." "They did not make use of that provision. If they felt that the votes were not properly counted, they had the option to request a recount. They cannot prove before the court that the results were wrong as they do not have the correct results," he said. Cde Mangwana told ZBC News yesterday that a 12-member legal team was ready for the responses to litigation by Mr Chamisa, with the opposing papers bearing testimony of the party's commitment to safeguard the interest of the electorate. "Indeed we shall be filing our opposing papers tomorrow (today) by 10am and we are ready for whatever they are arguing as we are really committed to the case," he said. "By our law, results of a presidential election must be announced by the chairperson. In casu, the chairperson delegated, in her presence, the task to all the commissioners. This was in breach of mandatory statutory provisions. No explanation exists for this breach," his lawyers wrote. Other irregularities cited by Mr Chamisa's lawyers include the announcement of results on a provincial basis instead of per constituency. "In terms of the law, the results of a presidential election must be announced on a constituency by constituency basis. The results that are being challenged were for reasons that have not been stated and which are alien to law announced on a province by province basis," the application reads. Further, the bulk of the other 21 Presidential candidates cited as respondents in the MDC Alliance's petition said they had not been served with any papers, with some slamming Mr Chamisa, for trying to drag them into his battles.